“I didn’t sign up for this,” stated Justin Hopson, when his dream job as a New Jersey State Trooper turned into a nightmare. In 2007 the New York Times broke the news of the conclusion to an historic and shocking case (Justin Hopson v State of New Jersey case, #03CV5817, U.S. Federal Court Camden New Jersey District) of police corruption in an article called “New Jersey Agrees to Settle Trooper’s Harassment Suit.” The article reports Hopson’s victory in his federal lawsuit filed against the state – a case stemming from his charges of having been harassed by a secret society of state troopers after refusing to testify in support of an unlawful arrest and false report made by his training officer, the topic of his new memoir “Breaking the Blue Wall: One Man's War Against Police Corruption” (published by WestBow Press). 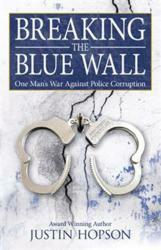 In “Breaking the Blue Wall” Hopson reveals new information and insight about the historic case and his experience as the whistleblower who exposed the scandalous unlawful arrest, and the subsequent harassment he received from the Lords of Discipline, a secret society within the New Jersey State Police looking to suppress Hopson’s defiance. “With only 11 days on the job as a New Jersey State Trooper, I witnessed an unlawful arrest and falsified report made by my training officer,” he says. Hopson, refusing to compromise himself, his values or his oath to protect and serve, acted the only way he knew how – with honor and integrity. “Breaking the Blue Wall” demonstrates how one committed individual can stand up to the social forces of fear, intimidation and corruption. “I was an ordinary cop with an extraordinary cause,” says Hopson. Now he is the officer who stood in the face of a powerful force and refused to back down. He is the man who blew the lid off corruption in the police force. Justin Hopson holds a Master of Arts in management and has a high degree of professional training in such areas as gang awareness, management evaluation and critical first response. He has been certified as a state police instructor and American Heart Association healthcare provider. After retiring as a New Jersey State Trooper in 2007, Hopson founded Hopson Investigations, a state licensed private investigative firm based in Charleston, South Carolina. He was appointed to the Charleston County Alcohol and Drug Abuse Advisory Board in May 2009 and became a member of the South Carolina Association of Legal Investigators in June 2010. WestBow Press is a strategic self-publishing alliance of Thomas Nelson, the world’s premier Christian publisher, and Author Solutions, Inc. (ASI)—the world leader in the fastest-growing segment of publishing. Through this partnership, authors benefit from the rich publishing heritage of Thomas Nelson and the speed-to-market advantages of the ASI self-publishing model. Titles published through WestBow Press will be evaluated for sales potential and considered for publication under the Thomas Nelson imprint. For more information, or to start publishing today, visit westbowpress.com or call 866-928-1240.